Are there things about your body that you’d like to be different? Have you tried all kinds of things to create change but none of them seem to work how you’d like them to? Perhaps what your body is really asking for is kindness. We have these incredible bodies that do so much for us every minute of every day, yet we rarely if ever stop to acknowledge the gift they truly be. Instead, we judge them like crazy, ignore what they’re asking, and expect them to keep going no matter what we’re choosing. Bodies put up with so much from us! What if simply being kind to your body could contribute more to it than you ever imagined? Our bodies generously give so much to us, how much could our lives change if we started being kinder to them? 1. Pay attention to babies and small children. Do you notice the joy that babies and children have just being them? There’s no judgment or problems in their world. Do you remember that feeling? All that’s required is the sense of it. Children delight in just being alive. They play, and laugh, and explore with their bodies just for the fun of it. When you begin tapping into that energy of how much fun life can be again, it’s an incredible gift to your body. It’s one of the easiest ways to offer tremendous kindness that can have a dynamic impact. 2. Start touching your body every day. It sounds deceptively simple, yet being present as you touch your body is a great way to begin connecting with it again. Notice how your arm or cheek or knee lights up when you touch it. Your body will be so grateful. We’ve learned to disconnect from our bodies. We often totally ignore all that they offer us. Touch allows us to connect to our bodies again, and to acknowledge the gift they are to us. 3. Ask your body questions. Most of us weren’t taught to talk to our bodies (other than impelling them with judgments). Yet this is one of the easiest and kindest things we can do for them! Asking your body questions can be as simple as, “Body, do you desire to go for a walk?” The response you get will be energetic, but you’ll know. You could also ask, “Do you require some food?” Or, “Body, what would be fun for you to do today?” Through asking questions we become more aware of what our bodies actually require from us. You may be surprised to discover that what your body requires is different than you thought. When we give our bodies what they actually desire instead of what we’ve projected at them, we offer a level of kindness that creates the space required for change. 4. Have gratitude and receive. Have you ever paused to really thank your body for all that it is and all that it contributes to you? Being grateful is this magical choice we can make that truly allows things to change. With gratitude, there is no space for judgement; it literally can’t exist at the same time. So when we choose to be grateful, even for the things we have judged the most about our bodies, it stops the incessant flow of judgmentally and allows for a different possibility. 5. Be willing to be weird enough to actually enjoy your body. Can being weird be a kindness? Look around, how many people do you know that actually enjoy their bodies? Isn’t that incredible? Over 7 billion of us and virtually everyone over the age of 10 rarely enjoys this incredible gift they’ve been given. Choosing to enjoy your body again is incredibly kind. It’s not a common choice; are you willing to be that weird? If you’ll begin to practice these 5 steps every day, you may be surprised at the change that’s possible. When we honor the capacities of our bodies, listening to what they have to say, and inviting the joy we once had with them to be part of our lives again, we offer them a tremendous level of kindness. You have an amazing body. What would it be like if you started treating it as the incredible gift beyond measure it can truly be? Dain Heer is an internationally renowned author, speaker and facilitator of consciousness and change who, for the past 14 years, has been inviting people to embrace their true greatness. 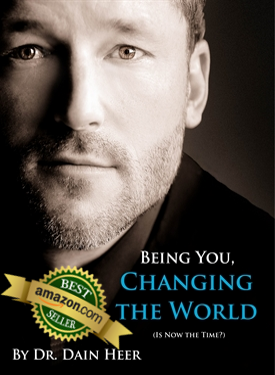 His book, Being You, Changing the World is published in nine languages. Join Dr Dain Heer in Sydney for his special evening event Being You, Beyond Problems on August 3rd from 7pm. Learn how to overcome problems with ease and move into creation and possibility. Find more information and tickets available here.